Journalists played into the GOP's 2014 strategy by spurring unwarranted Ebola hysteria. Have they learned nothing? In search of a winning issue for the approaching midterm elections, the Republican Party has seized on a strategy of cynically stoking the public’s fears and called for the sealing of the U.S.-Mexico border to stem a shadowy threat. Donald Trump and the right’s propaganda outlets are playing a key role, feeding their audiences a constant slurry of conspiracy theories. And mainstream journalists, especially on the major broadcast and cable news networks, are bolstering the GOP’s plan by saturating the airwaves with alarmist coverage that sends the message that the nation is facing a crisis. It is October 2014, and President Barack Obama’s administration is responding to the diagnosis of a handful of U.S. Ebola patients following an outbreak of the disease in West Africa. Journalists would eventually realize that the irresponsible, hysterical coverage -- including nearly 1,000 broadcast and cable news segments in the four weeks before Election Day -- had failed to properly contextualize the story and thus misled the public, and the Obama administration’s handling of Ebola was ultimately vindicated. But the GOP’s political strategy -- aided by Trump, who used his Twitter feed to panic the public -- succeeded as panicked voters helped Republicans take control of the Senate and expand their majority in the House. The right’s propagandists declared victory and moved on to their next smear, while Trump, having proved he could apply his skill at demagoguery to the political arena, began laying the groundwork for his presidential run. Four years later, the combination of factors that allowed the GOP to so effectively stoke fears about Ebola to win elections seems to have returned. As the 2018 midterms approach, Republicans want voters to fear a caravan of migrants headed toward the U.S.-Mexico border. Trump is again leading the effort -- this time from the White House -- using the presidential bully pulpit to promote a never-ending stream of brazen, absurd lies from right-wing propaganda outlets. And mainstream journalists, having seemingly learned little from their Ebola coverage, are playing into Trump’s hands, producing wall-to-wall coverage of the caravan that presents the story as a fast-unfolding catastrophe. 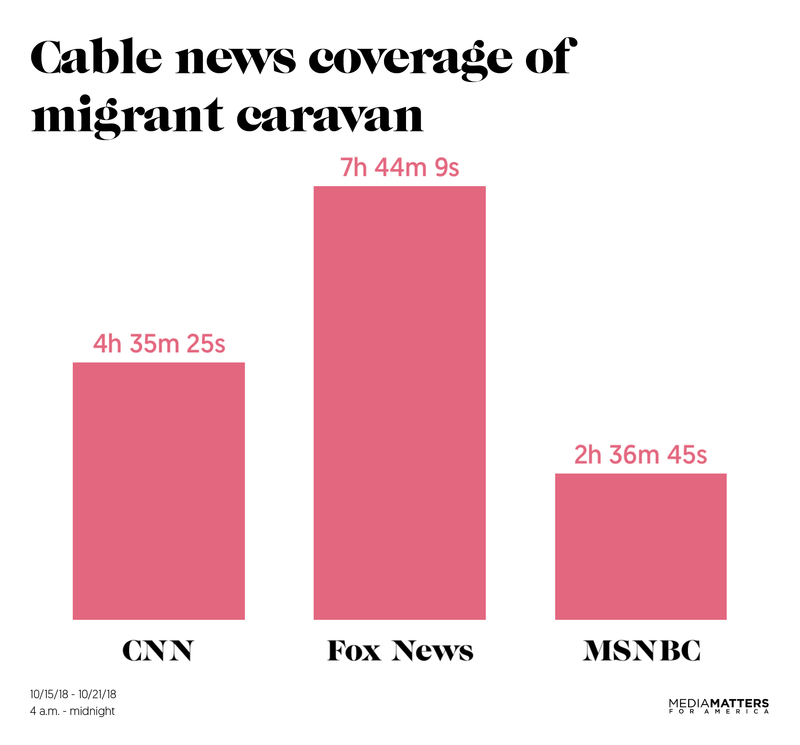 Fox News, CNN, and MSNBC devoted nearly 15 hours of coverage to the caravan from October 15 to October 21. Fox News gave the story the most coverage out of the three, and the network was not subtle about it. Fox’s early coverage featured contributor Newt Gingrich urging Republicans to turn the caravan into an election issue. Trump quickly got the message and began falsely blaming Democrats for the caravan, and the resulting feedback loop has turned the story into Fox’s dominant narrative, with chyrons warning of an “immigration crisis” and commentators predicting violence, voter fraud, and the annihilation of civilization if the caravan is not stopped. But as Trump fixated on the story, the other two cable networks have devoted an increasing portion of their airtime to it. Their sheer volume of coverage implicitly suggests a crisis is underway. The broadcast networks are leading with the story on the evening news, while newspaper editors splash photos of the caravan across their front pages. And Trump is bragging that his strategy is working, telling reporters that the unending b-roll of migrants headed north would help Republicans in the midterms. As with the Ebola outbreak, the story of the caravan of migrants is a real one that deserves attention. But in the same manner that the infection of a handful in the U.S. triggered all-encompassing hysteria, the volume and tenor of Trump’s response and the resulting media coverage have drastically outpaced reality. The caravan is currently 1,000 miles away in southern Mexico. The Mexican government dispersed a similar caravan earlier this year and prevented most of the migrants from reaching the border; those who made it to the border were largely turned away. It seems likely that, with careful pressure and support from the U.S., the same thing will happen this time. The similarities between the Ebola and caravan stories go beyond the overwrought media reaction each has received. Both cases have serious public policy implications. But the Republican responses seem designed to stoke and capitalize on panic, and if implemented would actually make the problem worse. In 2014, Trump and the GOP called for travel bans from the West African nations where Ebola had killed thousands, even as experts argued that such restrictions would worsen the epidemic. 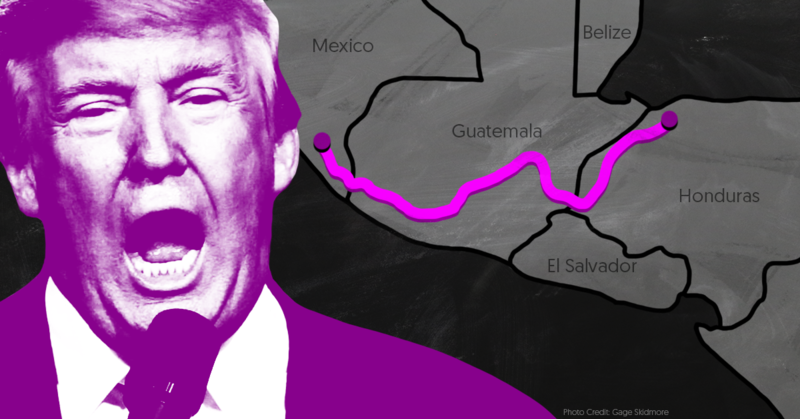 Trump’s response to the caravan has been to threaten aid to Central American countries; if he followed through, the result would almost certainly be increased migration from those nations. And in both cases, Trump and his right-wing allies are spinning out absurd conspiracy theories in an effort to panic the public. In 2014, they accused Obama of deliberately trying to infect the nation and lying to the American people for political and ideological reasons, and pushed hoaxes about Ebola-infected ISIS terrorists trying to enter the country from Mexico. This time around, Trump controls the federal government, so it’s the Democrats in Congress who are supposedly in favor of destroying the country. But what hasn’t changed is Trump and the conservative media fabricating a terrorist link -- with the president and his team explicitly acknowledging he has no evidence one exists. In 2014, Republicans won the midterms and stopped talking about Ebola. With that, after spending weeks whipping the public into a panic, TV producers lost interest in the story and the coverage cratered. We’re about to find out if they learned anything from that failure. So far, the results feel like a rerun. "What's going to happen when those Syrian refugees open fire in a Chick-fil-A"? Fox News' Todd Starnes, November 17. The bile is coming in over the transom so quickly it's getting hard to keep up, as the conservative media signal their latest xenophobic and Islamophobic outburst, this time targeting refugees fleeing war-torn Syria. Not interested in having a serious debate about how or when to accept mostly Muslim refugees in the wake of the Paris terrorist massacre, Fox News is sponsoring a far-right hate brigade that not only targets refugees, but President Obama, too. It's a bigoted bank shot for conservative commentators: Accuse Obama of coddling would-be terrorists (including widows and orphans) who are viewed as encroaching on our borders. Or so goes the battle cry, which accuses the president of abdicating America's national security -- and allegedly doing so on purpose. *Fox's Jesse Watters: Obama is inviting in "the barbarians at the gate." *Fox's Andrea Tantaros: "Everything that the president is doing seems to benefit what ISIS is doing." *Ben Stein: Obama's "hatred of America" may be "because he's part black." "He does not wish America well." In other words, there's a dark, invading force that Obama won't stop. In fact, he seems intent on welcoming it across the border so it can wreak havoc here at home. Is this now becoming an annual autumn tradition? Some Fox talkers are even connecting the refugee/Ebola dots, although they fail to see it as problematic. "He's imported illegal aliens," said Watters of Obama. "Remember he brought all of the Ebola victims into this country?" Andrea Tantaros fretted that people who traveled and showed symptoms of Ebola will "seek treatment from a witch doctor" instead of going to the hospital, while Rush Limbaugh implied Obama wanted Ebola to spread in America. That last point is key to understanding the levels to which Fox talkers and their allies sink in their Obama Derangement Syndrome, both in 2014 and in 2015: The Obama administration didn't supposedly bungle the Ebola scare because it was incompetent. It bungled Ebola because Obama wanted Americans infected. *Laura Ingraham: Obama's willing to expose the U.S. military to "the Ebola virus to carry out this redistribution of the privileged's wealth." *Michael Savage: Obama "wants to infect the nation with Ebola" in order "to make things fair and equitable" in the world. *Fox's Keith Ablow: Obama won't protect America from Ebola because his "affinities, his affiliations are with" Africa and "not us ... He's their leader." Ablow added, "We don't have a president who has the American people as his primary interest." Twelve months later we're witnessing the same kind of toxic sewage (what else should we call it? ), as Fox leads the campaign to condemn the president of the United States a terrorist-sympathizer who can't be trusted to deal with Syrian refugees. "Here's What Should Scare You About Ebola" read one overexcited New Republic headline, while CNN's Ashleigh Banfield speculated that "All ISIS would need to do is send a few of its suicide killers into an Ebola-affected zone and then get them on some mass transit, somewhere where they would need to be to affect the most damage." To date, we haven't seen the press regularly duplicate that kind of recklessness with the refugee story, although there have been some notable stumbles. Let's hope the press resists Fox News' siren call for more bigotry. Where's The Media's Ebola Mea Culpa? "The outbreak of Ebola virus disease in Liberia is over," announced the World Health Organization on May 9, declaring a cautious end to the deadly wave that claimed 4,700 Liberian lives since last summer. That outbreak, of course, eventually sparked panic in the United States last September and October when a handful of Ebola cases were confirmed domestically. Ebola mania raged in the media for weeks and became one of the biggest news stories of 2014. So how did the American media cover the latest, good-news Ebola story in the days following the WHO announcement? Very, very quietly. By my count, ABC News devoted just brief mentions of the story on Good Morning America and its Sunday talk show, This Week. On NBC, only the Today show noted the development, while CBS This Morning and the CBS Evening News set aside brief mentions. None of the network newscasts have given this Ebola story full segments, according to a transcript search via Nexis. Pretty amazing, considering that late last year the U.S. news media were in the grips of self-induced Ebola hysteria. During one peak week, cable news channels mentioned "Ebola" over 4,000 times, while the Washington Post homepage one night featured at least 15 Ebola-related articles and columns, many of which focused on both the international crisis and the political dynamic, and the problems Ebola was supposedly causing President Obama. That's not to say the tragic outbreak was not a big story worthy of any news coverage. It was, but American media went into overdrive hyping concerns that a deadly domestic outbreak was imminent -- only to rapidly forget. The recent look-away coverage from Ebola shouldn't come as a surprise. The American media lost complete interest in the story right after Republicans lost interest in the story, which is to say right after last November's midterm elections, when they brandished Ebola as a partisan weapon. Fox News media critic Howard Kurtz echoed his colleague Shepard Smith's admonishment of media for irresponsible Ebola coverage, highlighting his own network's reporting failures. Kurtz called out media figures like Fox host Bill O'Reilly, who has demanded the resignation of CDC director Tom Frieden, for reducing their response to Ebola "to a question of which heads should roll." He contrasted coverage like O'Reilly's to that of Fox's Shepard Smith, who made headlines this week for blasting media's "irresponsible" and "hysterical" Ebola coverage. Smith "challenged his own profession to stop scaring people," Kurtz explained, asking, "Will the media listen?" There's a growing media drumbeat on how to fix the Ebola crisis. [D]oes anyone really believe that turning CDC over to an acting director will quickly boost the agency's performance? Bill O'Reilly has demanded that Frieden be fired, calling him the "chief propagandist" for the "dumb and dangerous" approach of expecting airport screening to be able to keep infected people out of the United States. "Frieden showed up late to the game again on Ebola, which is not acceptable when lives are at stake." THE MINUTE: Conservative Media Rush To Politicize First Case Of Ebola In U.S.